It’s that time of the year again! Christmas is coming! 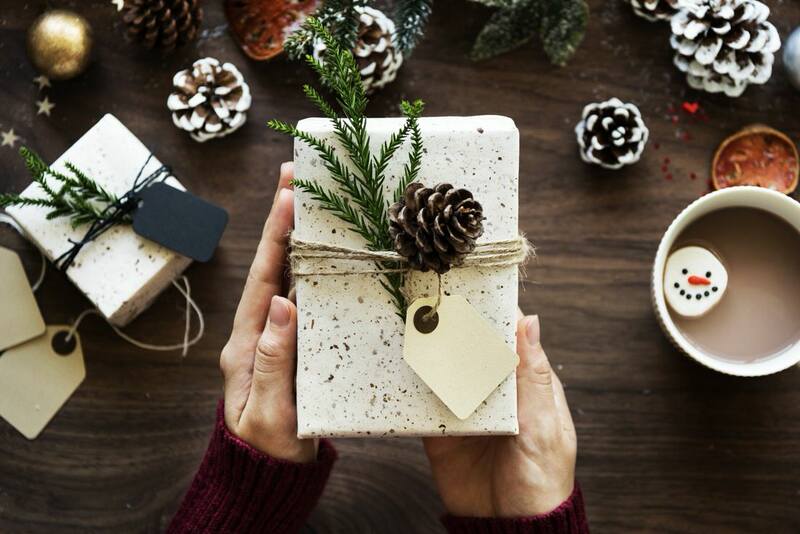 If you run your own little business – be it photography services, online courses, blog, your own little cover store or crafts you sell online – you need to get that Christmas feel going! 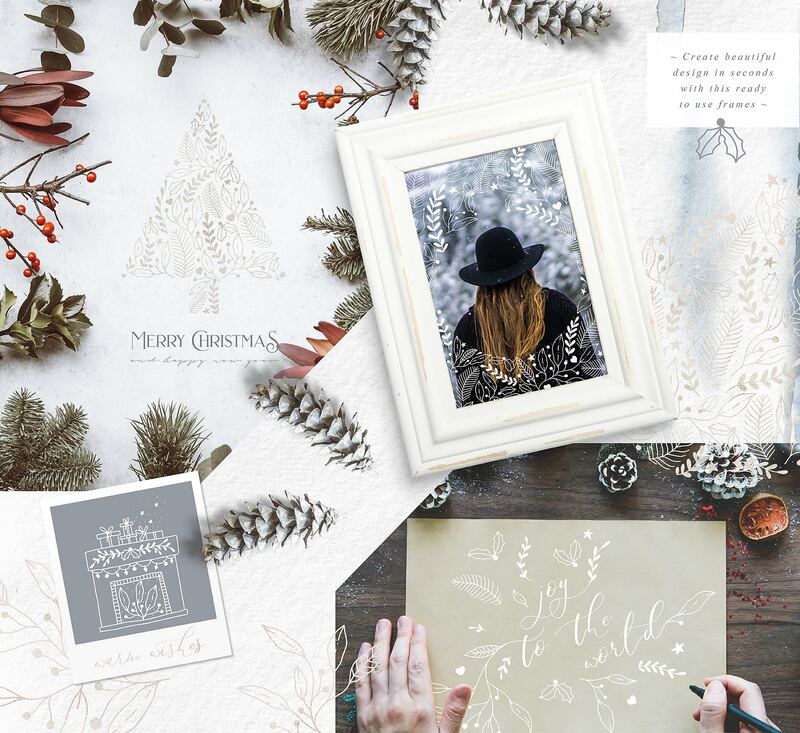 To help you with that, I scoured the internet and found the most stunning Christmas graphics and digital resources for this year! 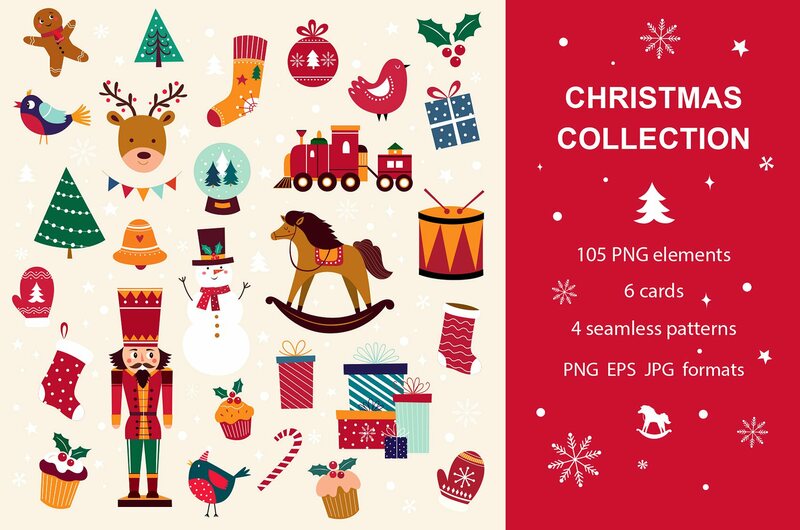 The list includes both free and premium Christmas graphics, illustrations, fonts, mockups, scenes, and photography. 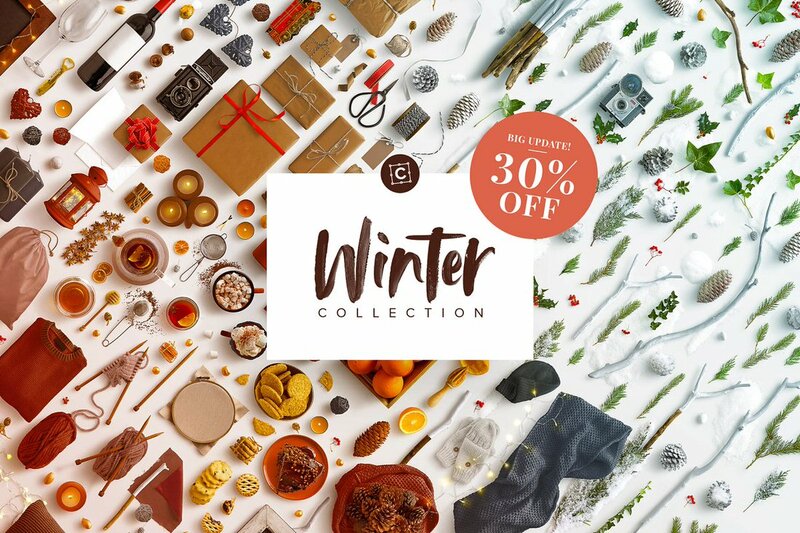 You can use the free download files or purchase your graphics and fonts for a couple of dollars to decorate your Instagram posts, create special Holiday offer graphics, design and print postcards for your clients or create Holiday products of your own using these collections. Let us start with Christmas graphics and illustrations we can get for free. 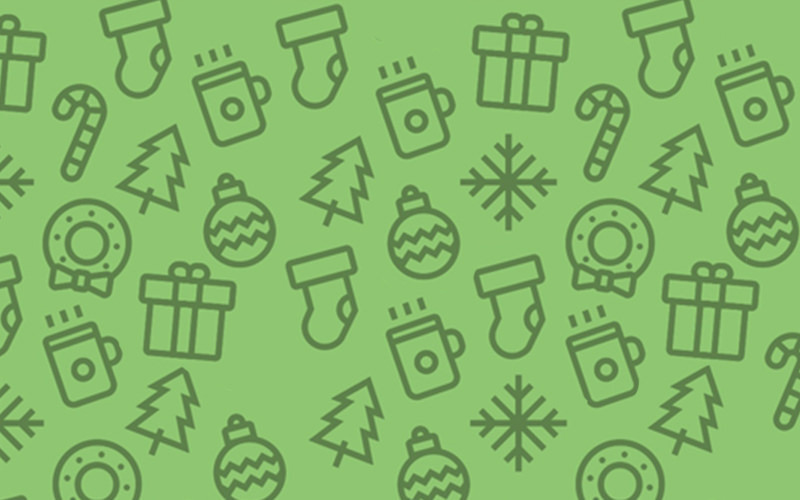 Here are a couple of nice holiday icons, illustrations, and graphics that can be downloaded for free! find the link below each image. Note that some of these websites require you to subscribe to their email list before you can download the graphic for free. Here is a set of 14 cute watercolor Christmas gift clipart. The download includes each little gift box as a separate png file with a transparent background. Available for a free download here. Perfect to add on top of your photography – 10 pre-made greetings and phrases. Since these graphics are hand-drawn, you can’t change the text itself but you can change the color and scale them to any size. Download for free here. If you’re looking to add a bit of Holiday spirit to your website or your Instagram story highlight thumbnails, you might like these cute, simple Christmas icons. Free for personal and commercial use – download for free here. Another lovely Christmas icons set. This one is a bit more delicate, created using thin lines. 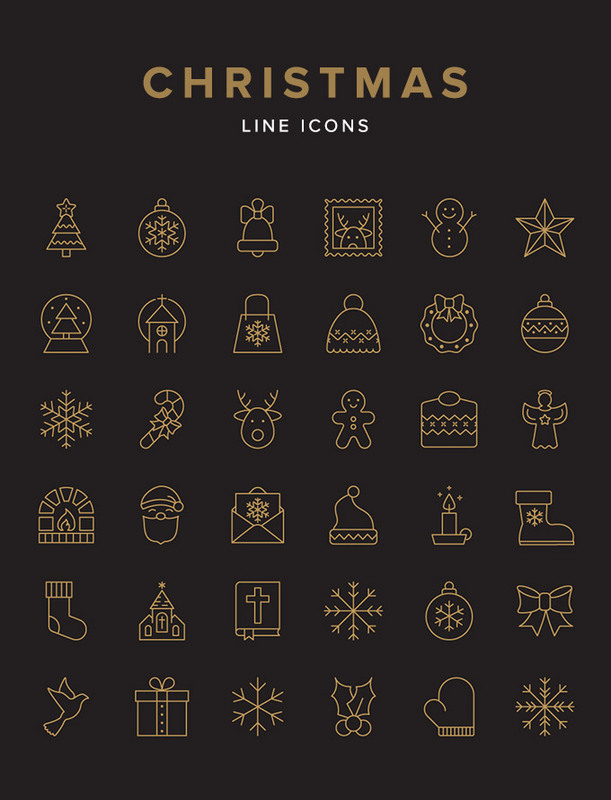 This free icon set consists of 36 masterly-crafted Christmas icons. Free to download and use here. 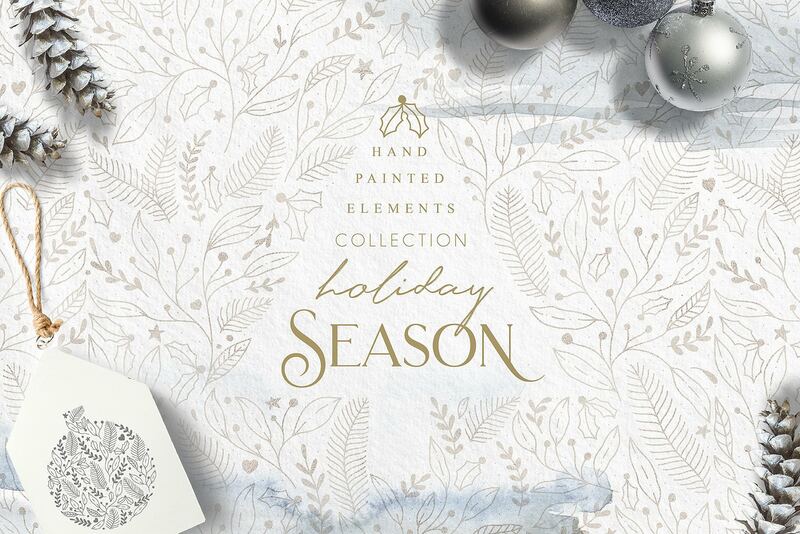 Although not designed for Christmas exactly, this beautiful watercolor set can be used to add a bit of wintery magic to your holiday projects. Aren’t they lovely? Download for free here. 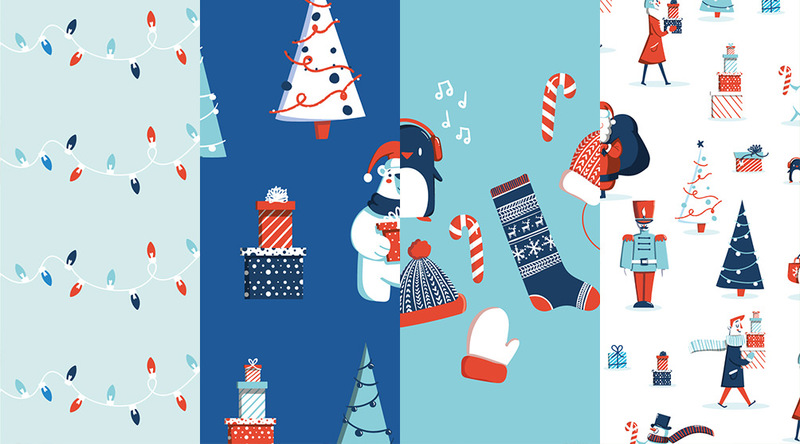 For a bit more traditional Christmas look, check out this colorful graphics set. 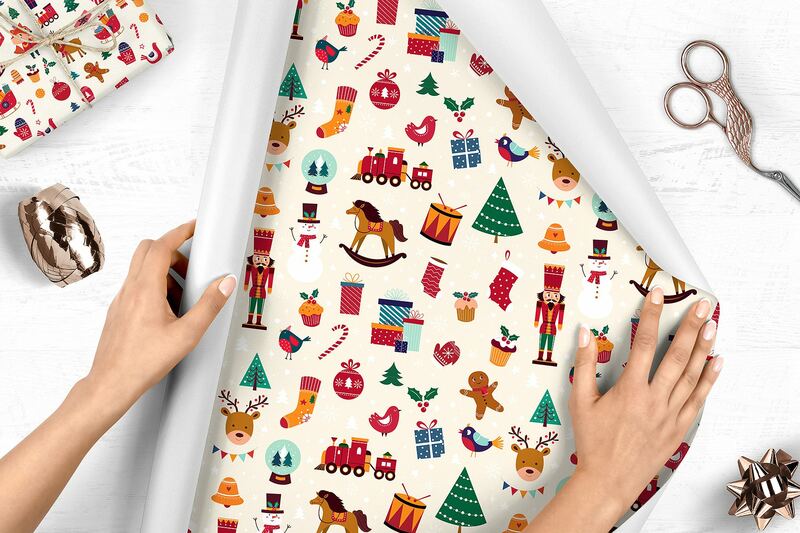 It could work quite well for custom wrapping paper or greeting cards. Free download here. 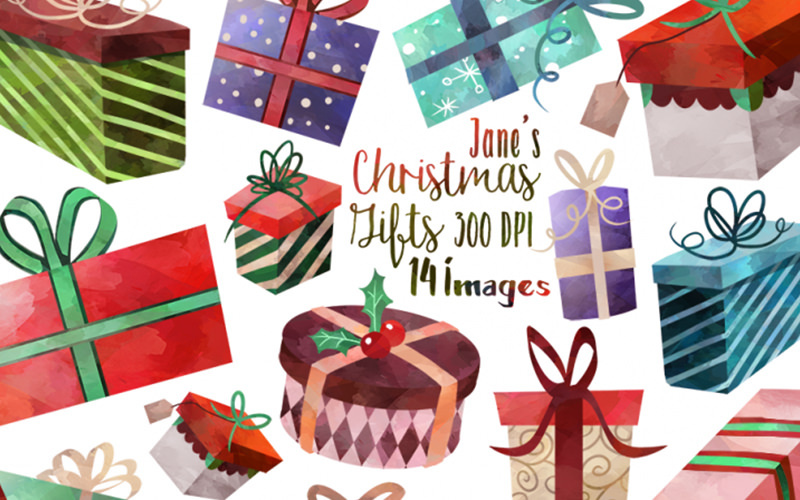 This pack contains 4 digital jpg and tiff patterns filled with cute illustrations. Print them and use as a wrapping paper of backgrounds for posters and cards. Free for download here. 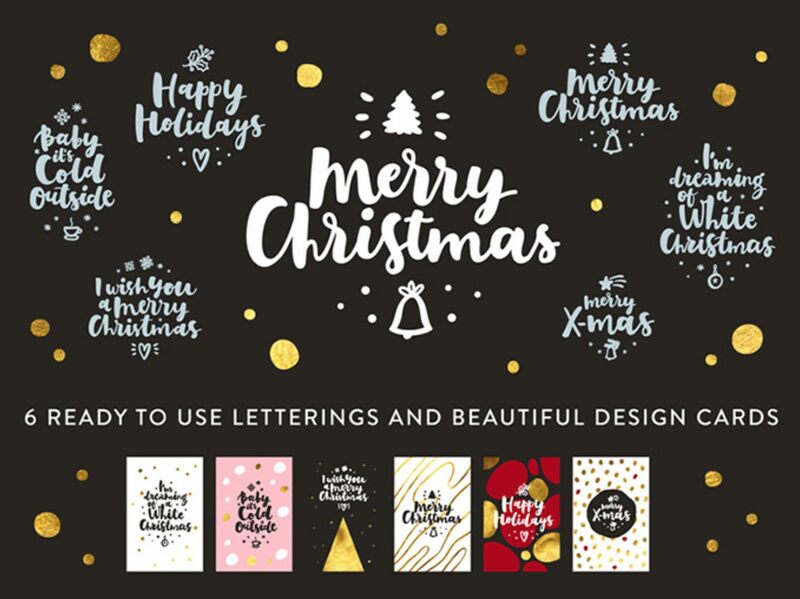 Another free lettering Christmas graphics set for your social media and greeting cards. You can’t change the text itself since it’s handwritten, but you can scale and colorize it if you need to. 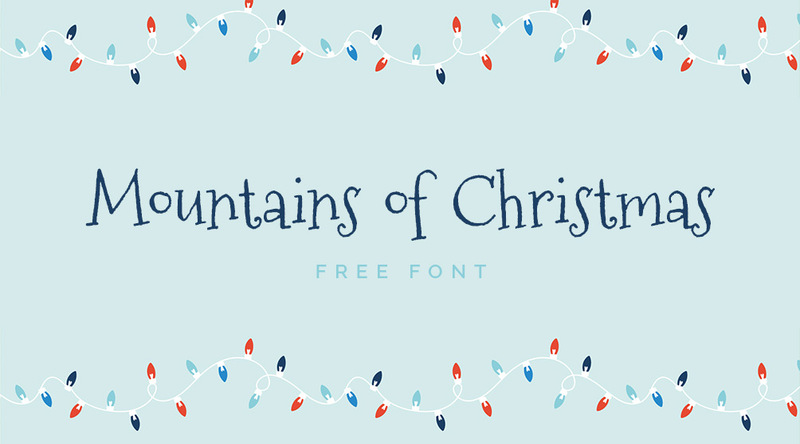 Download these Christmas lettering graphics here. 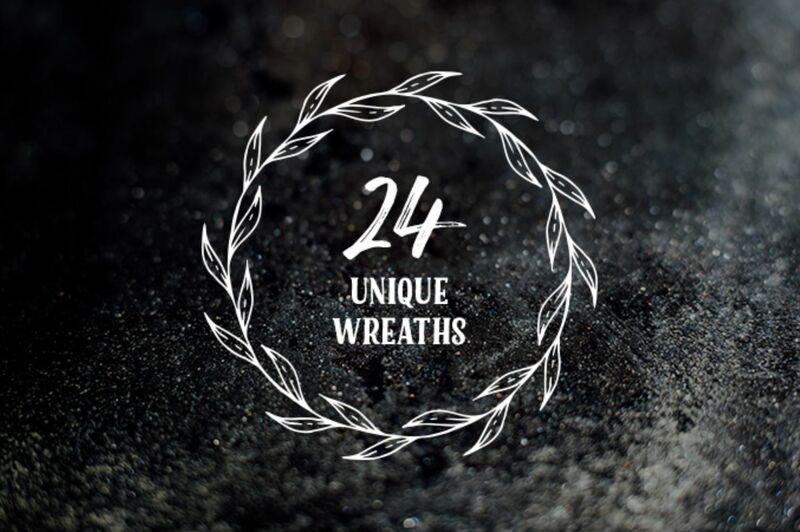 Not exactly made with Christmas in mind, but these are wreaths and it’s all about context! Wreaths and holidays go together perfectly. 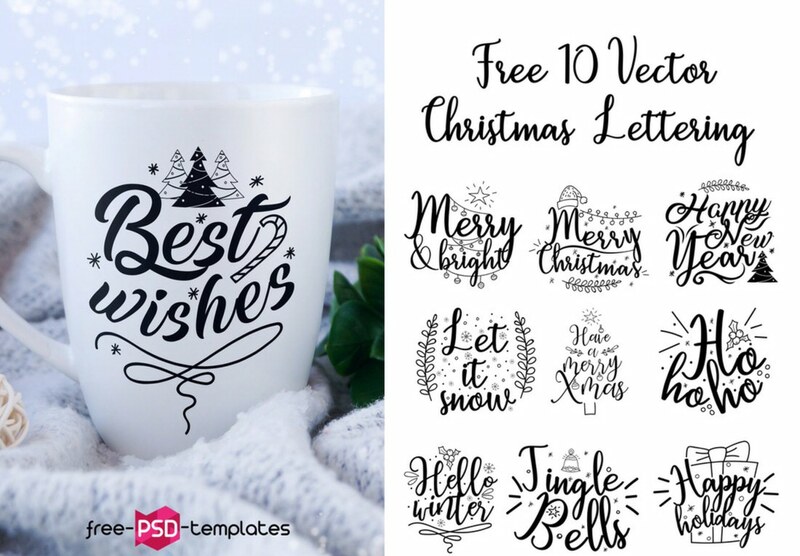 Here are 24 free wreath vector graphics you can use to frame your holiday greetings and holly jolly text. Download them for free here. Here are my top premium graphic art picks for this holiday season. For pretty obvious reasons, the quality here is much higher then free graphics, so if you can afford it, they are worth considering. The prices here vary from $10 to $22. To view the items up close, click on the links below each graphic. Let us start with this stunning Christmas collection filled with 48 graphic elements (birds, berries, flowers, and foliage), 10 floral wreaths, 8 frames, 7 patterns, and 4 pre-made cards. Basically, this collection has everything you might need this season. 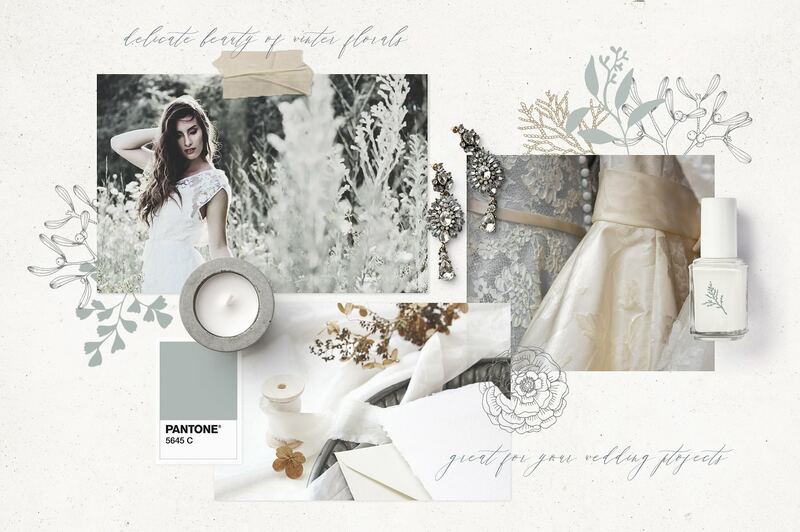 The style is elegant, festive, and perfectly delicate. Perfect for high-class, feminine brands. Up until November 30, it costs only $13 so don’t miss out and check it out here. 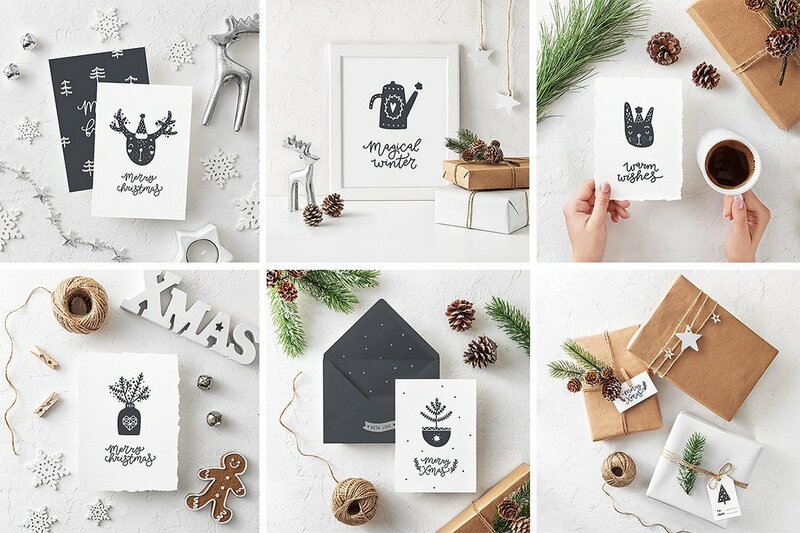 If you’re looking for some traditional holiday graphics, take a look at this collection by MoleskoStudio. It’s filled with more than 100 individual elements that are ready to print. You’ll get cut graphics, cards, patterns and tags for only $16. Aren’t they cute?! 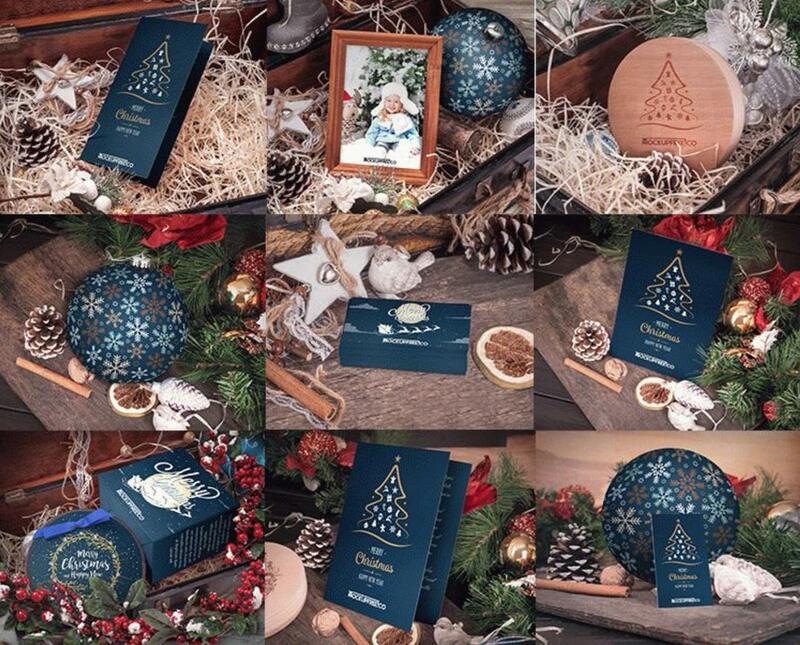 Check out the Christmas Collection here. If you’re active on social media, you need this pack! Maggie Molloy has created an amazing hand-drawn phrases collection that will be perfect for your Instagram, Facebook, and as printable overlays that you can place over your photography. You can’t edit the text itself since it’s all hand drawn, but you can change color and size. These phrase graphics can be modified in Photoshop, Illustrator, and Lightroom! It costs only $15, so check it out here! 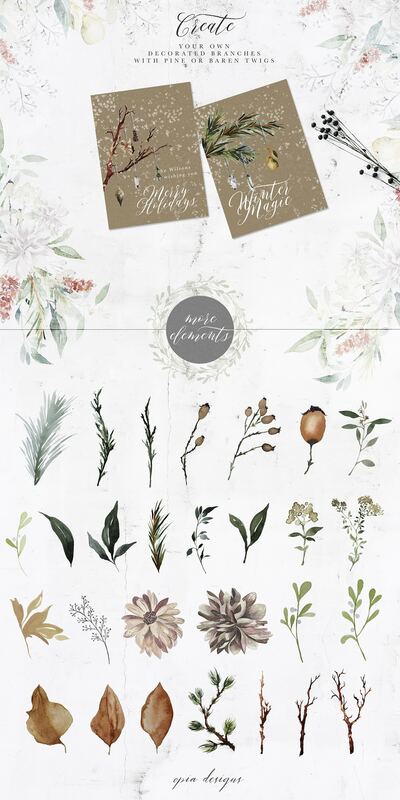 This delicate graphics collection includes beautiful florals and foliage, patterns and ready to use frames you can place over your photography, as well as a couple of holiday themed illustrations and geometric frames. It will cost you $14 and you can view it right here. 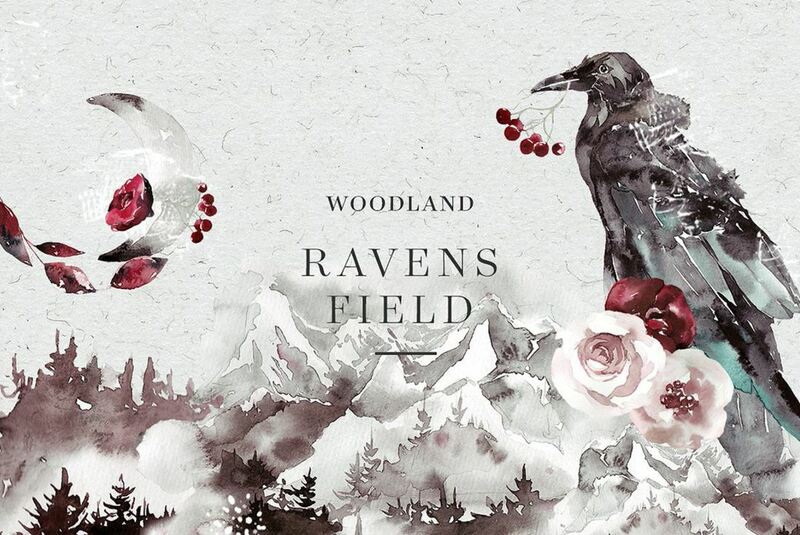 If you like watercolor art, you will love this collection. 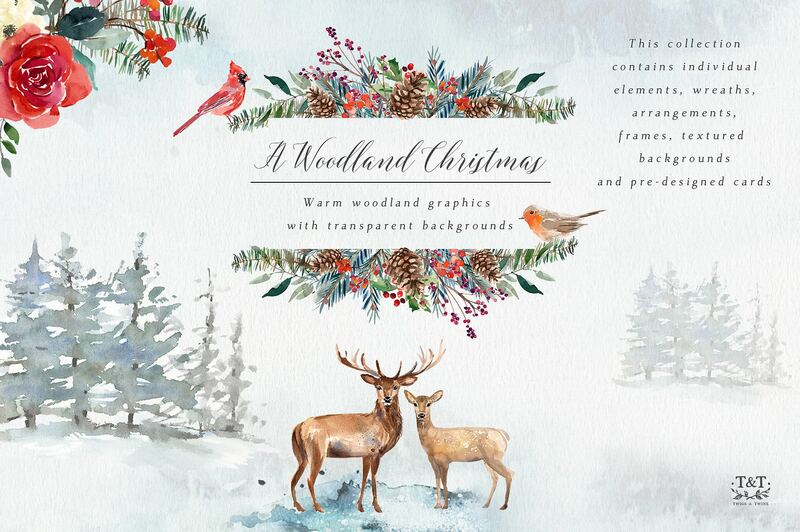 Filled with magical, wintery woodland graphics, each element is hand painted and perfectly unique. With this pack, you get watercolor illustrations with transparent backgrounds, washy watercolor backgrounds to use as backdrops, pre-made card designs, and frames. This one is a bit more expensive – $22, but well worth the price. Check out here. Another wonderful, festive collection. This one is using warm and cozy tones – gold, beige, grey, dusty orange. It really makes you feel all festive and cozy. This pack includes 50 individual illustrations, multiple pre-made graphics such as bouquets, stuffed socks, wreaths. 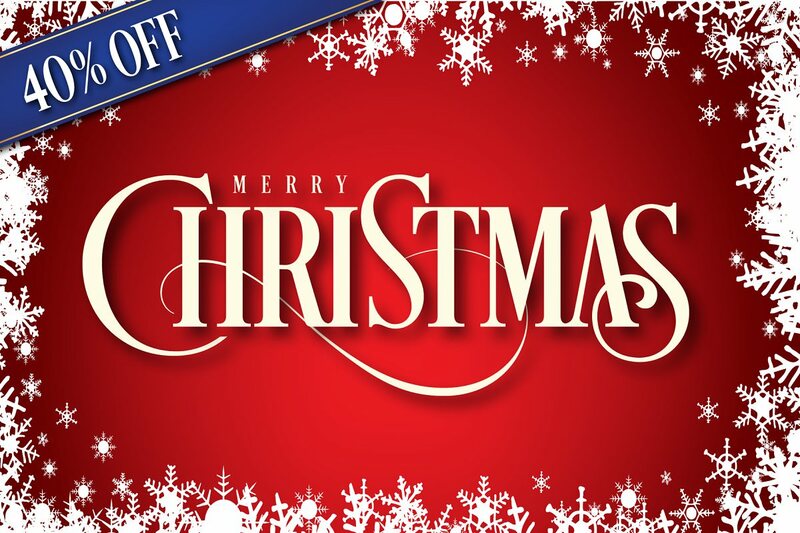 Many elements here are versatile enough for you to use even after the holiday season is over and it’s on discount right now so it costs only $10. Make sure you check it out! If you love all things farmhouse, you’ll love this Farmhouse Christmas Kit. 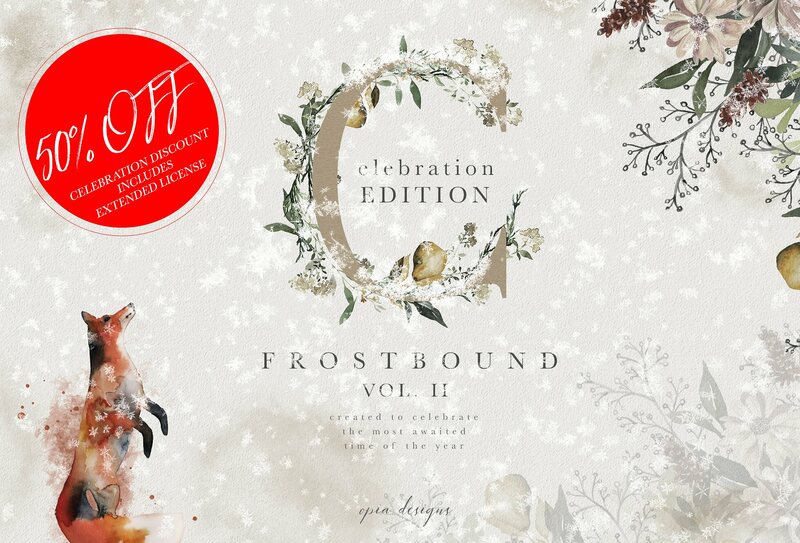 It includes 40 hand-lettered phrases, words, and greetings, 90 vector illustrations of all things farmhouse and Christmas, and editable Instagram templates for you to use! This collection costs $12 and is available here. Create little Christmas scenes for your cards with this charming creator kit. It includes more than 200 elements with animals, stylized map backgrounds, popular city elements, birds, boots and more! It will cost you $16 and see what you can do with it here. 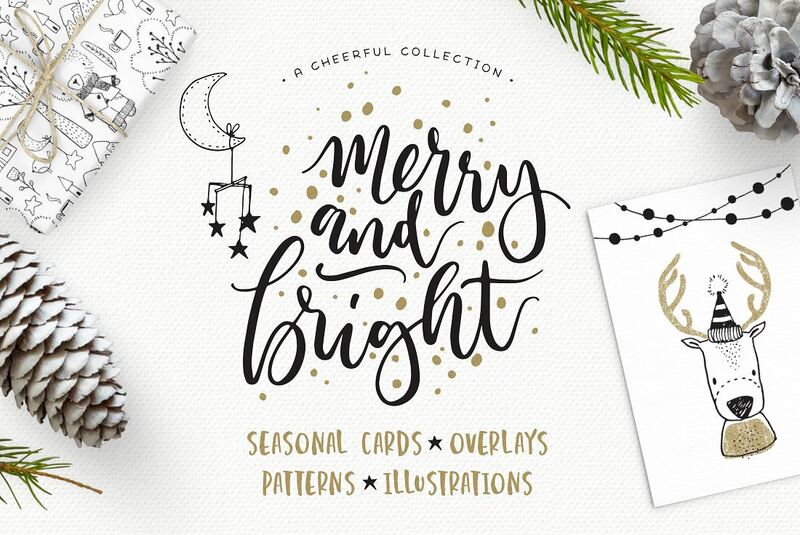 A perfect collection of illustrations, hand-lettered words, patterns and card designs for your holiday projects. This is a cute and whimsical design kit that you have to see! It costs $12 and you can see it here. If you’re not that familiar with Photoshop or Illustrator, this is the graphic design kit for you. 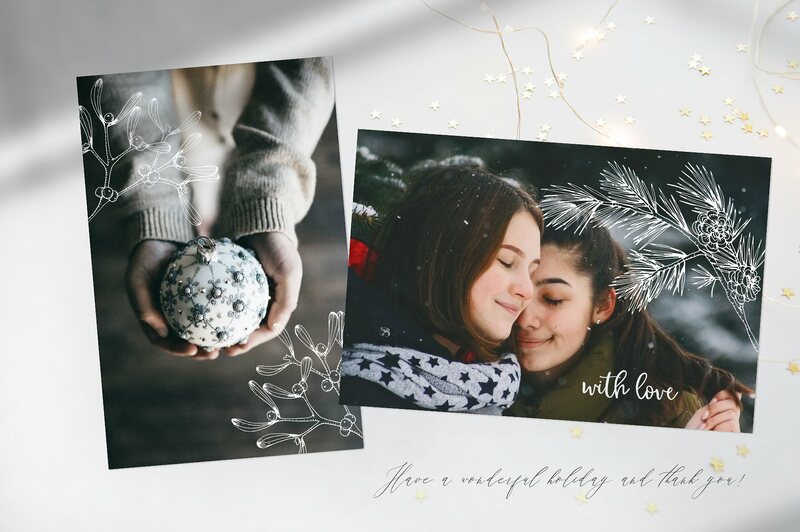 It consists of classy holiday-themed graphics, frames, and arrangements that you can use to create pretty cards in any text editing program – like Word or Pages! Of course, it will work in Photoshop, Illustrator, InDesign, and Sketch! This design kit costs $18 and it is available here. There are thousands of fonts out there that you can use to write what need to be written, but some fonts are better for the job than others. 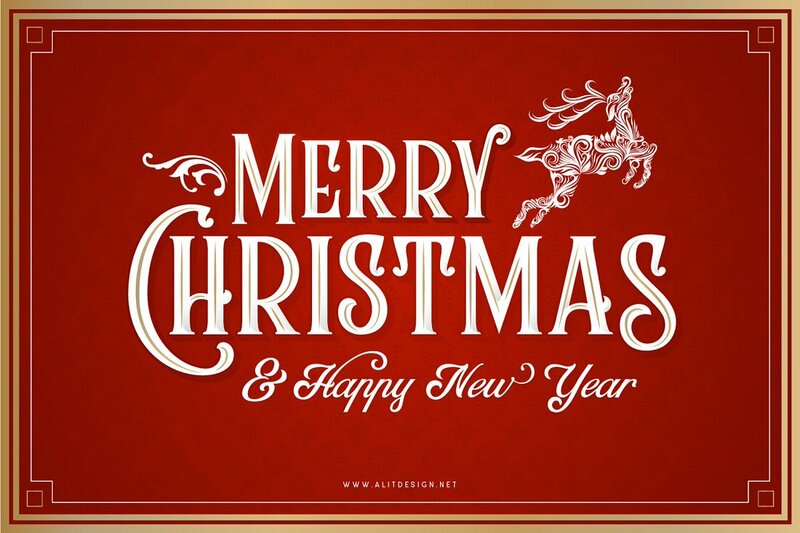 Just like with Christmas graphics, Christmas typography is a thing as well. 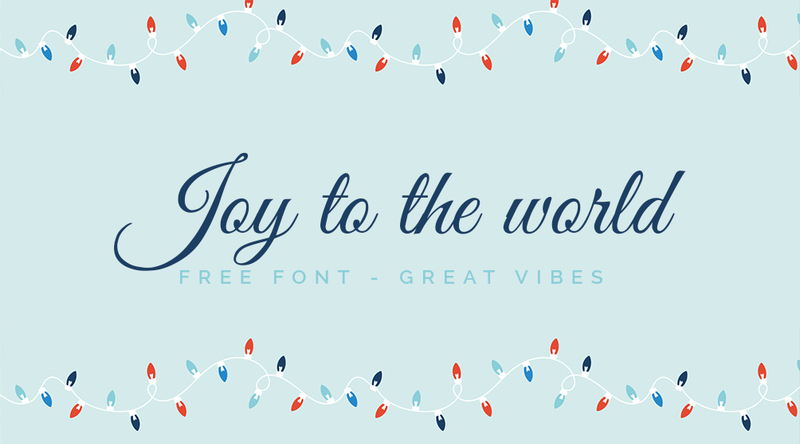 So here is a list of free festive typography, we think is suitable for the holiday season. All these free fonts are available for download from font repositories. They didn’t have any pre-made graphics, so I took the liberty of creating little presentations of my own here. 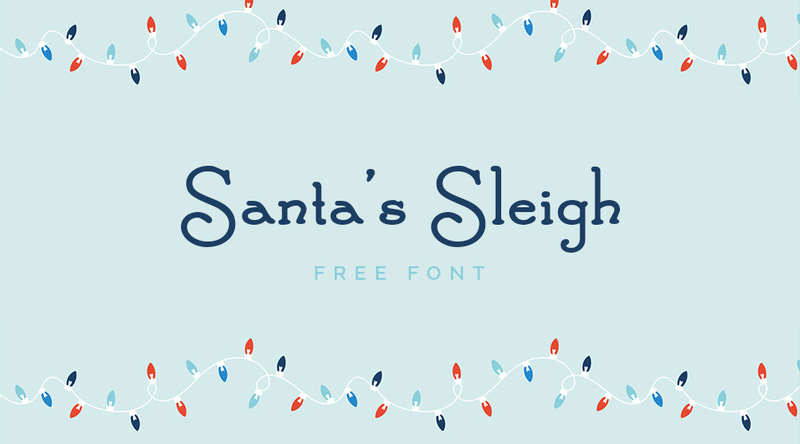 Santa’s Sleigh is a free, festive font that comes in 3 styles – regular, bold, and deluxe. You can download this font for free here. 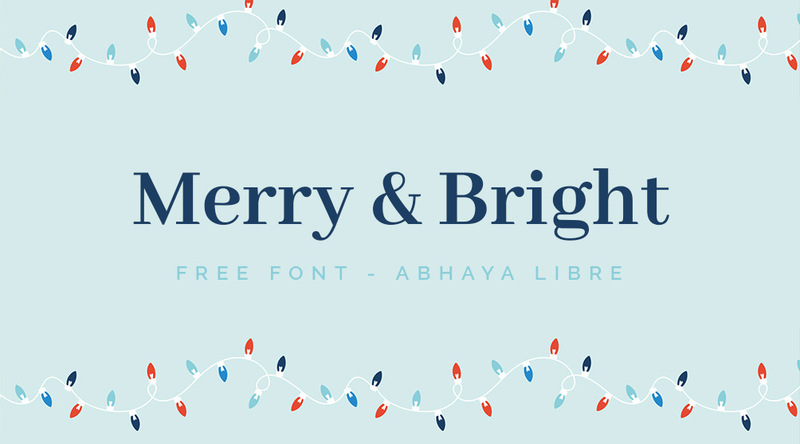 One of my favorite serif fonts – Abhaya Libre. Works great as a classy display font for headings on invitations, cards, posters, and labels. I’ve even used it for websites. You can check out which fonts for great with Abhaya Libre here. To download this free font, click here. 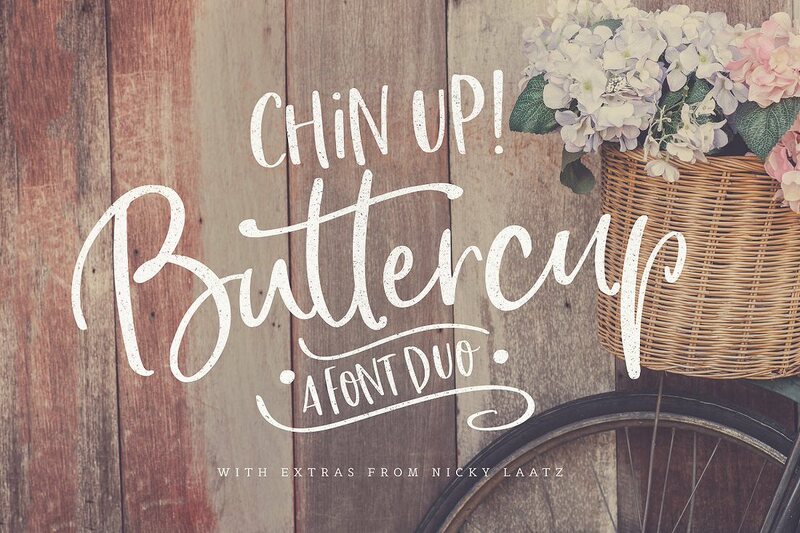 For a more whimsical, hand-drawn, and cozy font, check out Amatic SC. Download this font for free here. If you’re looking for a classic script font that looks as is written with an ink pen. The good old Great Vibes font id your best choice. Download Great Vibes for free here. 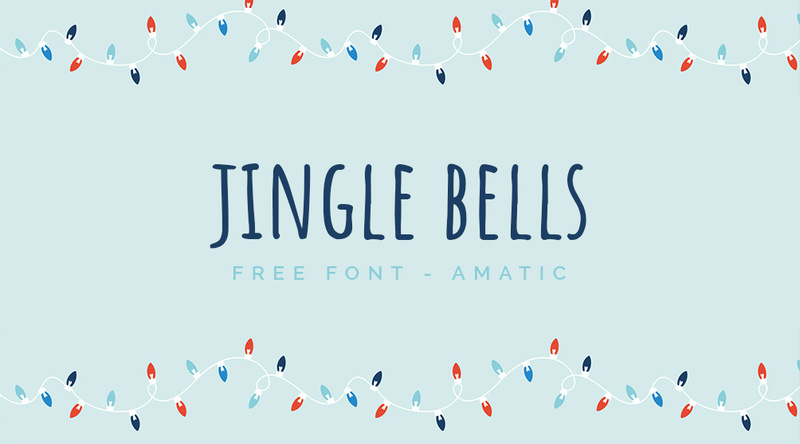 A proper Christmas font – bouncy, happy, childish and fun! All it needs is a couple of cute Christmas graphics. Download Mountains of Christmas here. Now that we have our graphics sorted out, let’s look at some premium festive typography that you can use for your Christmas projects. When talking about festive fonts, I imagine nice large swirls and swooshes. 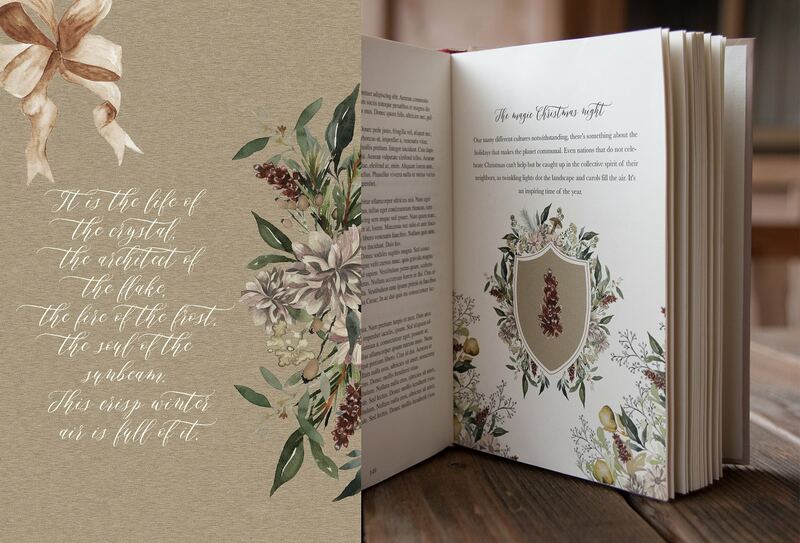 Regal, straight lettering and little accents that make it somehow special. “Desire” has all of these features and depending on the context it can serve well not only as a holiday font but any other display typography as well. It costs $59 and you can see and test it out here. This font requires Photoshop CC 2017 or Illustrator CC2018 or newer to use. But if you have these programs on your device, then this adorable gingerbread font is for you. 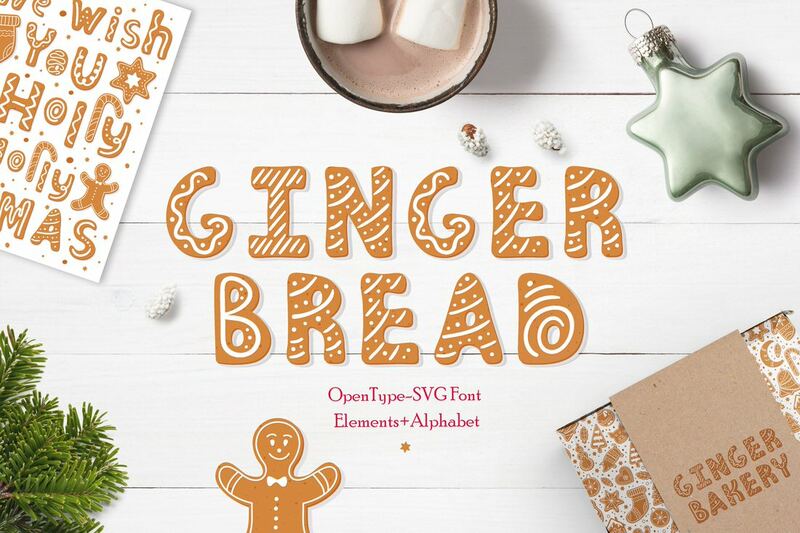 It consists of colored letters and as a bonus, you get 19 gingerbread graphics to add to your designs. It costs $12 and you can check it out here. 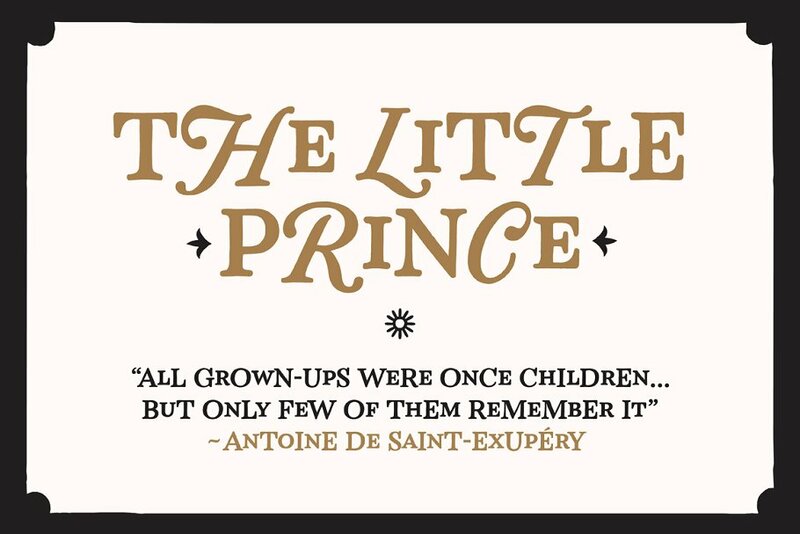 Christmas time is magical so a fairytale-like font suits the purpose well! This font is based on old-style English and traditional fonts with a bit of modern hand-lettering style added to it. It comes in 4 different styles, costs $24 and you can see it here. Although not technically a “Christmas font”, this cute hand-lettered font will go perfectly with rustic, farmhouse Christmas graphics. And it comes with a couple of graphics of its own so you’ll be able to use this font after the holidays are over as well! It costs $18 and you can see it here. 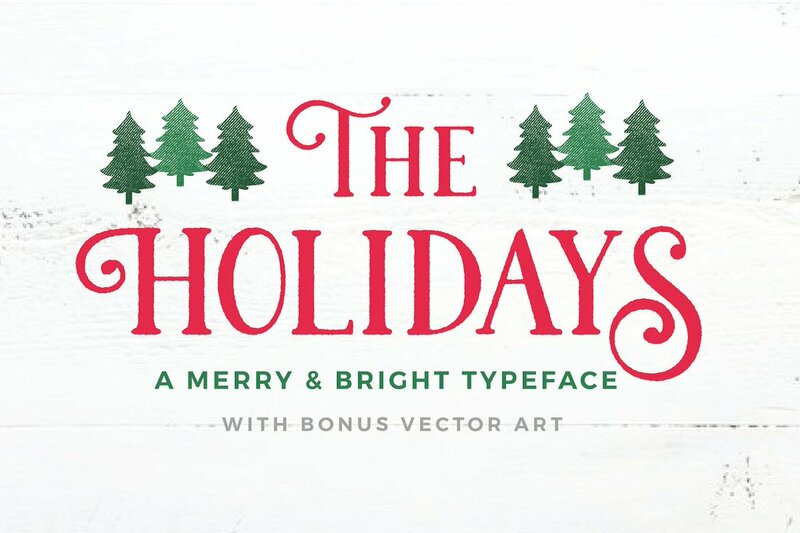 A typeface designed with Christmas in mind. 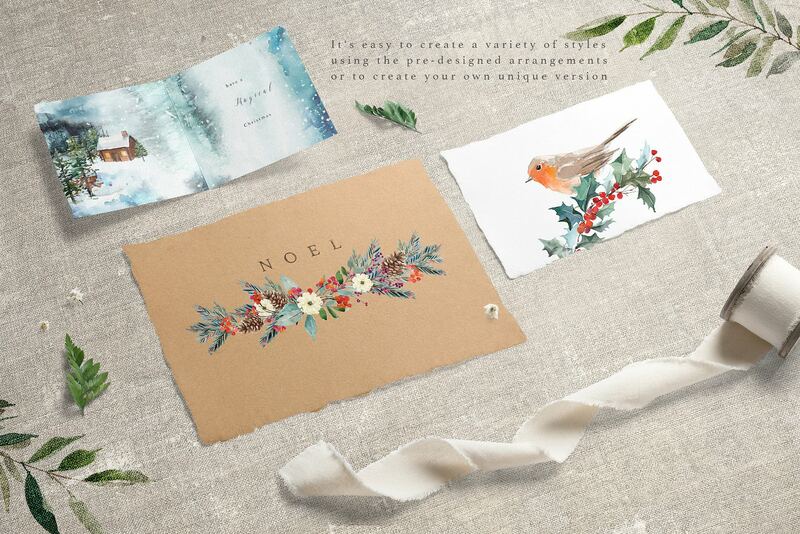 It’s classy, merry and super useful when designing your own Christmas cards! It costs $19 and you can view it here. 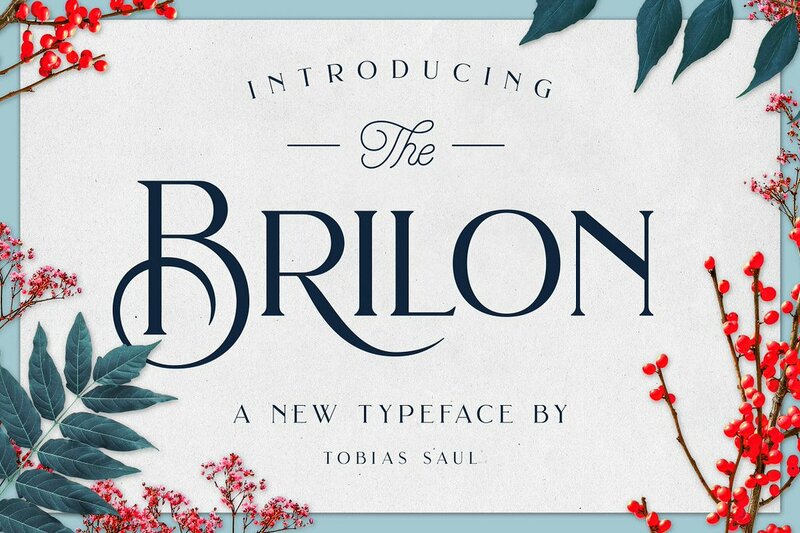 One of my favorite fonts – Brilon! It’s well made and comes with beautiful swashes. 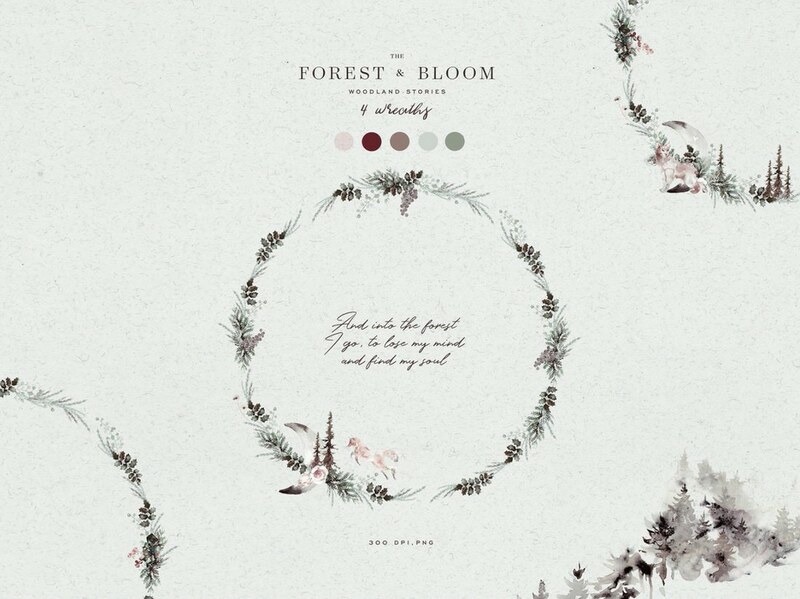 As a bonus, you will get 8 botanical photos – the same ones you see in the font presentation! This font will cost you $19 and you can see and test it here. 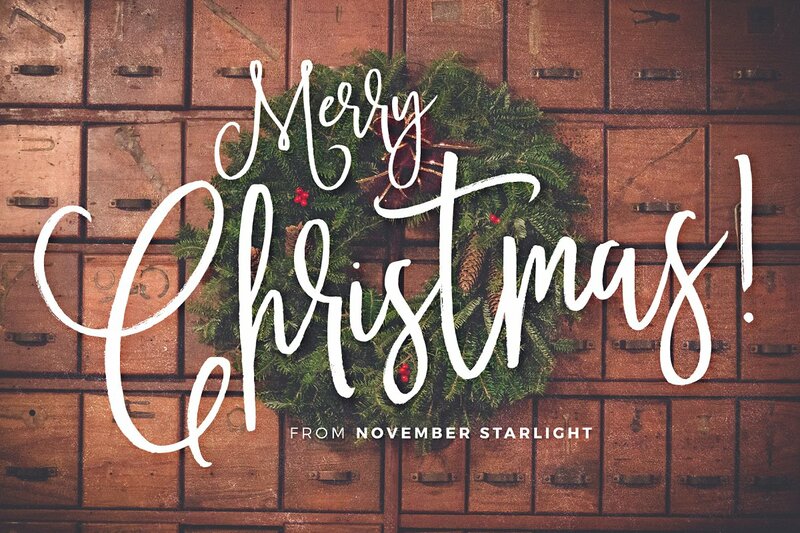 If you’re looking for a script font with a festive feel to it, you will love November Starlight. It comes in two variations – regular (looks like it’s written with a brush) and clean. It costs $16 and you can view it here. Another one from the more classy font variations. Rumble Brave is actually two fonts in one! You get an all-caps version and a script version if you purchase this font. It costs only $15 so make sure you check it out! This one is a bargain! 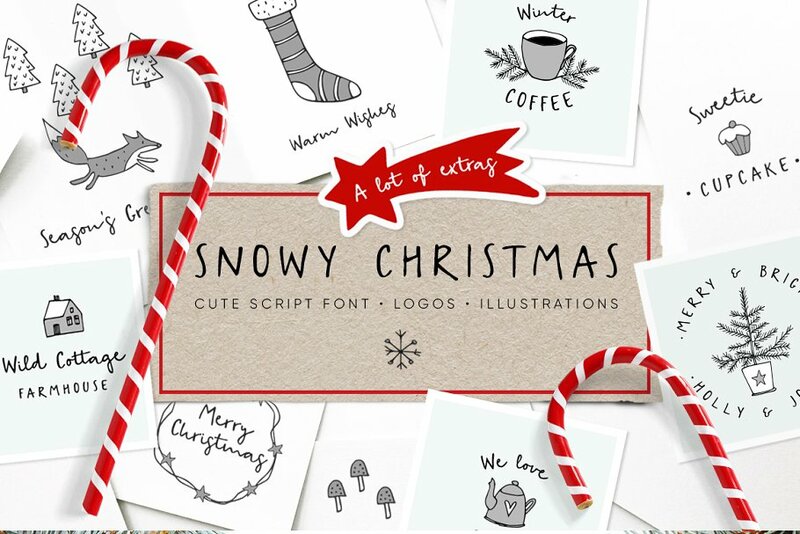 You not only get a cute hand-written font but a bunch of pre-made logos and 85 cute Christmas graphics, So if you’re on a budget this year – this is the pack for you – it has everything! The whole thing costs only $16. Check it out right here. 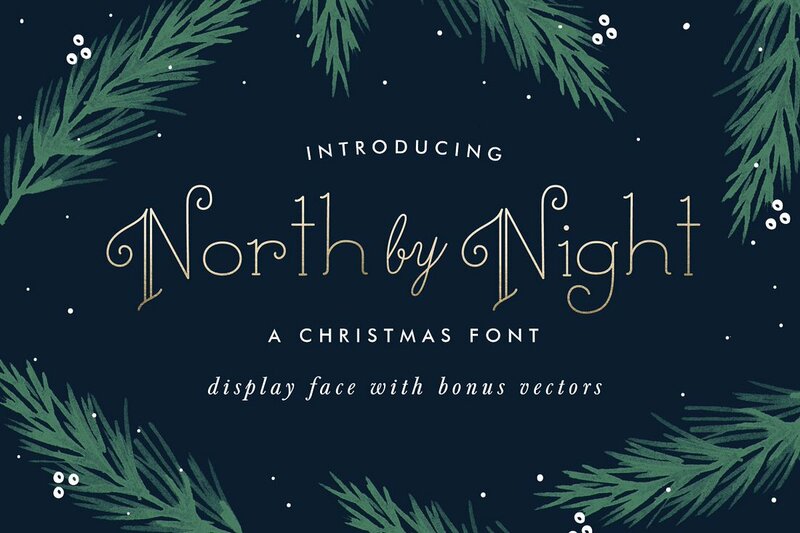 If you’re looking for a classy but cute font for your holiday projects, North by Night just might be the one. It’s clean and beautiful. 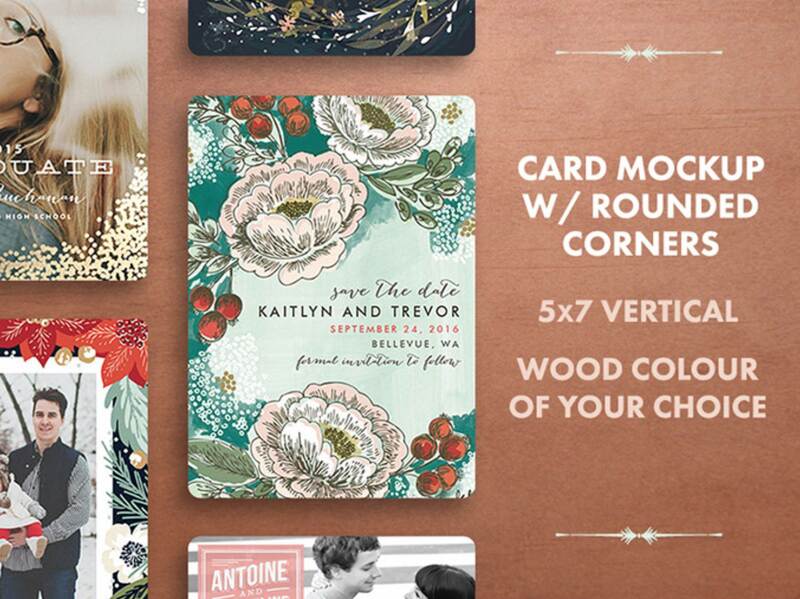 Perfect for cards and invitations. The price is $15 and you can see it here. You know that saying that goes “A picture is with 1000 words”? It’s true, because we’re visual creatures, but that doesn’t mean that you have to take every picture yourself! If you need to create a “Merry Christmas & Happy New Year” graphic but don’t have festive photography to use as backdrop, this list might help! 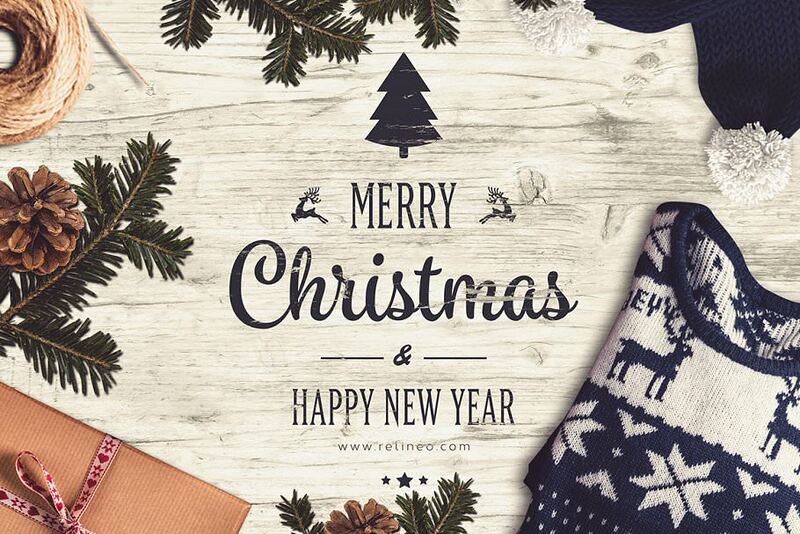 Grab this free Christmas greeting card mockup and replace the sample text with your own! To download it for free, type “0” in the price field. Click here for the download page. Another set of free holiday card mockups. you can place your own photography and art in these cards, change the background color and write your own text. Download for free here. 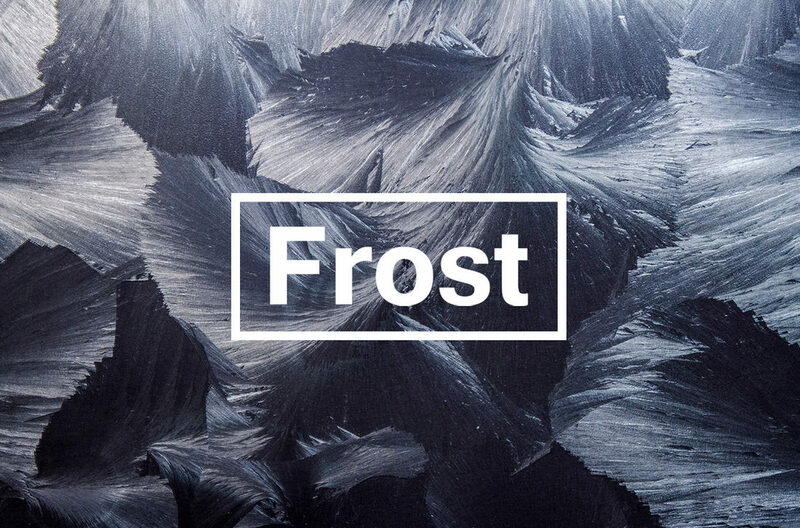 Looking for simple, wintery backgrounds to place your art on top? How about some beautiful ice queen worthy textures. They come in 8 variations, so check them out and download for free here. 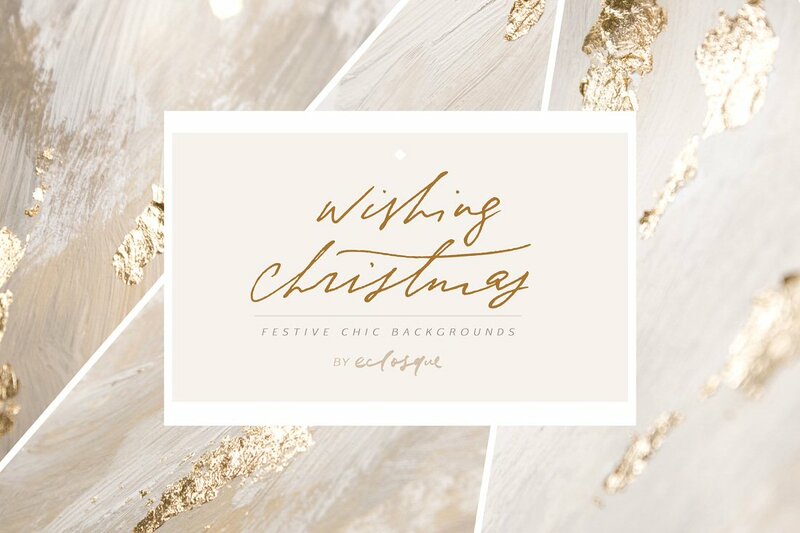 Creating your own Christmas graphics and need a festive way to present them? 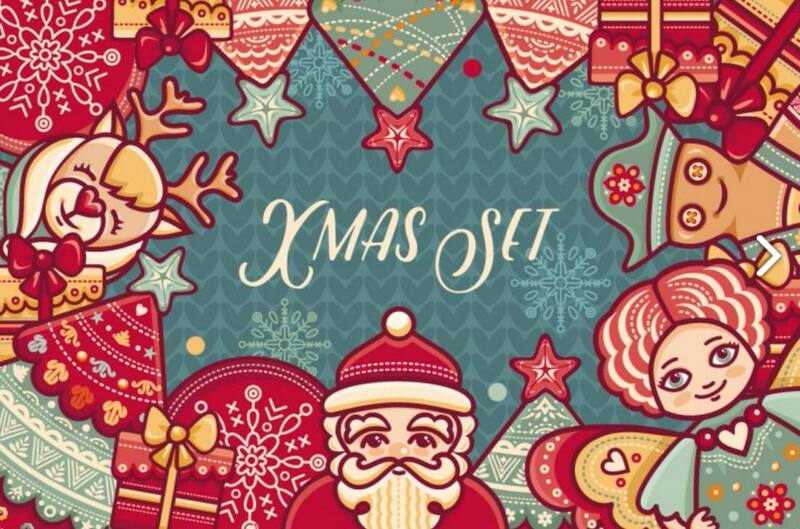 Check out these 14 free Christmas scene mockups. Free download here. Are you active on Facebook and Instagram selling your own merchandise? Then you will LOVE this Christmas template bindle! hard to believe it’s free! 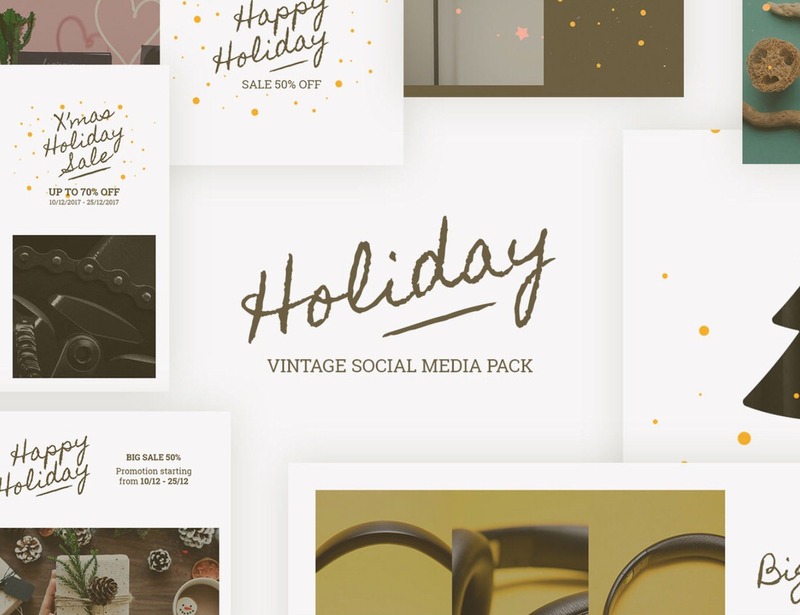 This collection consists of 12 Instagram templates and 12 Facebook templates with a bit of vintage twist and fancy layouts. Download them all for free here. As the last graphics resource in this free list, I want to mention unsplash.com This is an amazing site and if you’re not familiar with it yet, I guarantee you will love it! I’ve been using this website for years. It’s full amazing, free images for every occasion. Just type in the search bar what you’re looking for and start downloading! Here are some free Christmas themed images. 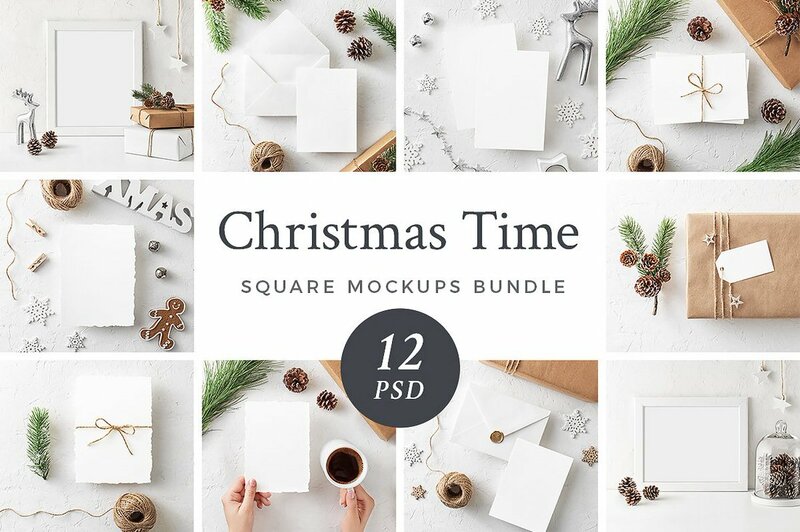 Now take a look what’s available if you spend a couple of dollars on your Christmas mockups and images. The prices in this list range form $7 to $49. Make it look like your workshop is all festive and fancy with these 12 Christmas photos! To place your art in these images, you will need Photoshop – keep that in mind. If you like this idea but don’t need all 12 designs, you can even purchase each of them separately. The whose 12 pack costs $25 and you can check it out here. Looking for something simple but elegant? 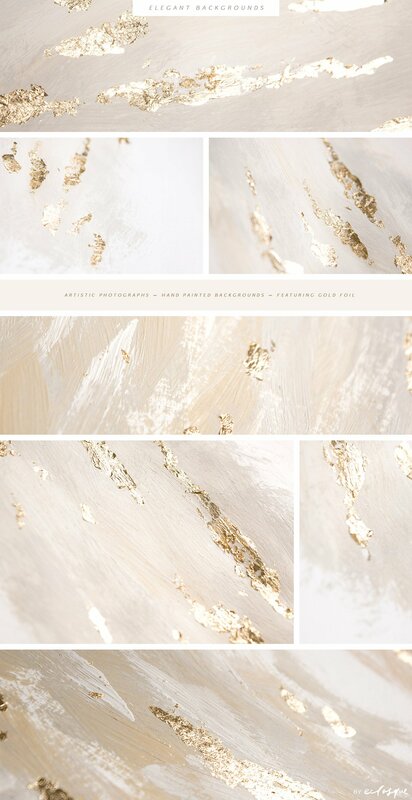 How about these Gold Foil background images?! There’s so soft, dreamy, and sophisticated. The pack comes with 5 different golden background sets and a couple of blurry bokeh images in super high resolution. The price is $15 and you can view them here. If you’re serious about creating beautiful scenes for your products – this is the graphics collection you need! It’s amazing – just look at it! It has more than 1400 isolated objects, 31 pre-made scenes, 30 backgrounds, and the ability to change colors. Since this collection has a bunch of generic elements as well, you’ll be able to use it after the festive season is over. It costs $49 and you can see all the elements here. Liked the previous collection, but looking for something a bit cheaper? Then check out this scene creator. 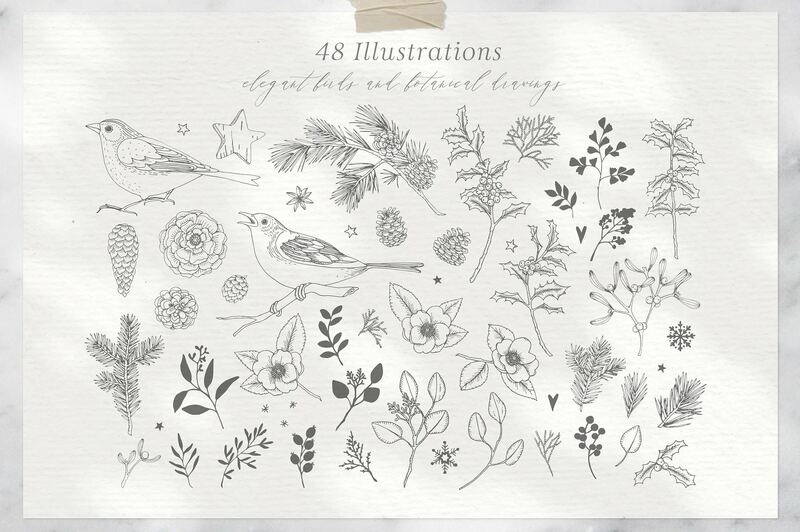 It has 145 wintery objects and 42 mock-ups for you to place your designs in. It costs $20 and you can check it out here. Need festive photography? 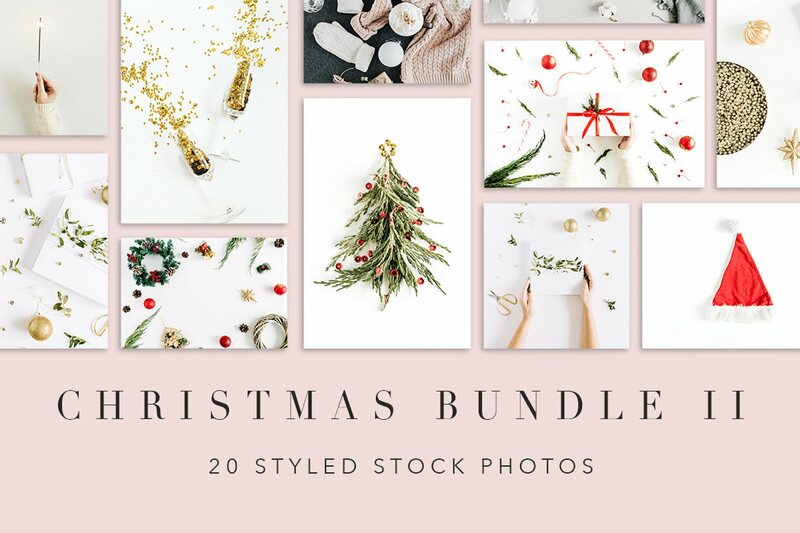 How about this nice Christmas photo bundle consisting of 20 styled stock photos. Perfect for your website, social media, and print. The price is $17 and you can see all the images here. 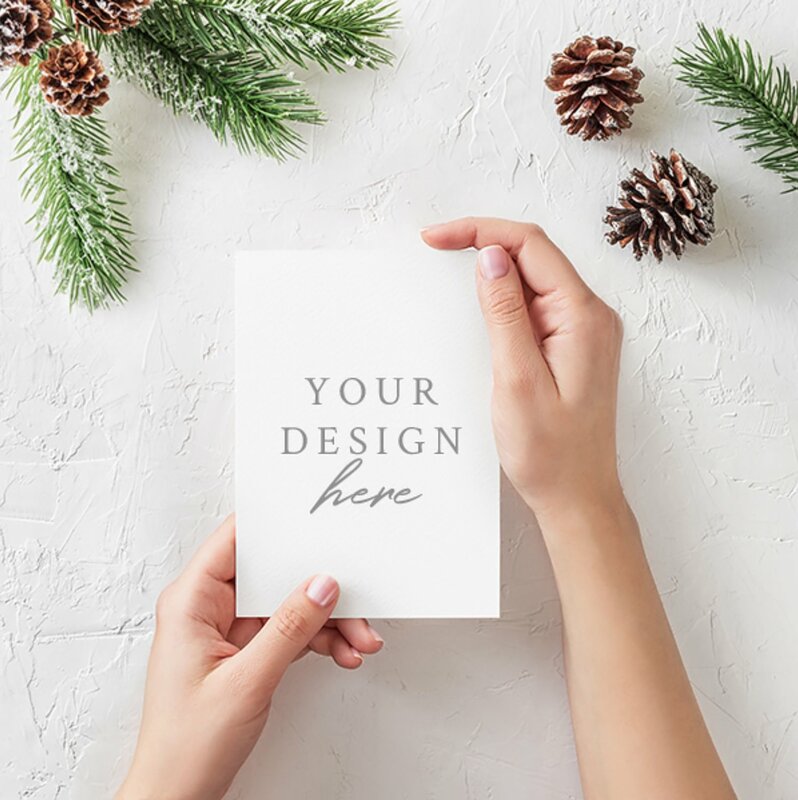 I truly hope that this list of Christmas graphics, fonts , images, and mockups helped you find the digital resources you needed to decorate your little digital business or create cards and gifts for your loved ones.